Card Review: 9.7 This is the "original" '84 design. 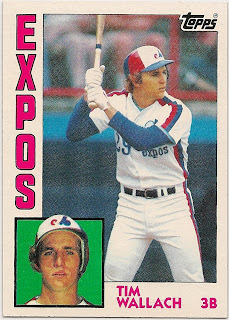 There are 5 variations of the 1984 Topps design I know of, the others being the O-Pee-Chee, Nestle, Tiffany, and the encased photo box. That may not seem like much to younger collector's today, but in 1984, it was absurd (I would argue it's still absurd). I like the '84 design. For the 2nd year in a row (and not done since), Topps went with the small head shot on the front of the card. I have no problem with the large team name going down the side and I love the blue and red backs. For awhile this was arguably the most sought after Topps set of the 80's, with the much coveted Don Mattingly and Darryl Strawberry rookie cards. I would have preferred a different color than green in the corner photo box, but that's nitpicking really. It's a solid image, even if Topps more or less recycled it on Wallach cards the next two years as well. Fun Facts: *Wallach made his 1st All-Star team in 1984. 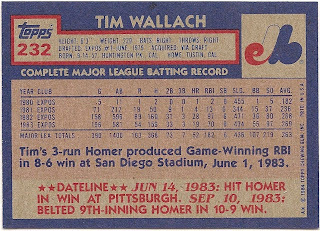 *Wallach was 2nd in the NL with 7 hit-by-pitch walks in 1984. 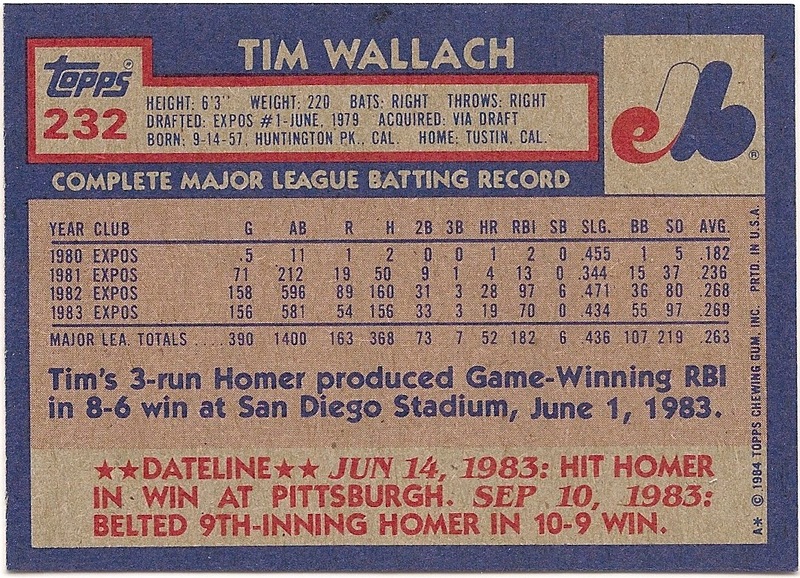 *Wallach led NL third basemen in assists and put-outs in 1984.